Following the quiz we developed for the NZGG on the impact of family history of colorectal cancer, an Auckland doctor reminded us of the importance of environmental factors. He highlighted the landmark epidemiological studies of Sir Richard Doll and included the graph below. 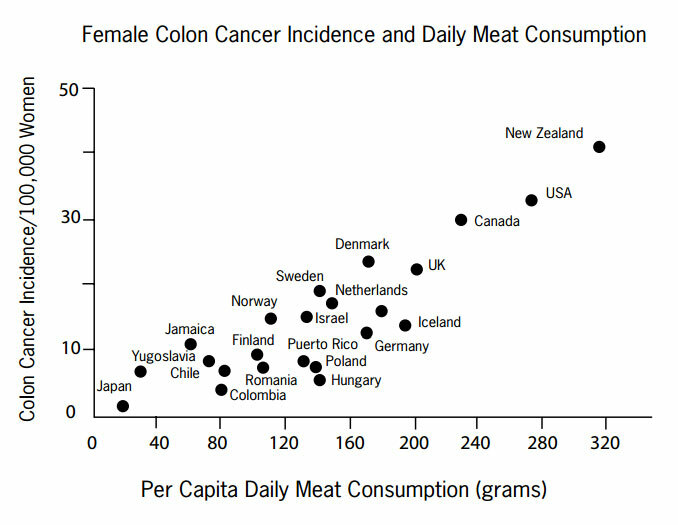 Published in 1975 it shows a strong link between meat consumption and colon cancer incidence, with New Zealand leading the world on both counts (Armstrong, 1975). Since the early 1980s there have been many detailed investigations of the effects of diet on cancer incidence. A high intake of meat which is high in animal fat, especially red meat, is thought to be a risk factor in the development of colon cancer. In New Zealand between 1975 and 1999 there was a steady reduction in the daily consumption of red meat and this is one of the reasons why colon cancer incidence rates are expected to decline. Red meat and processed meats in particular, should be eaten sparingly to minimise risk. When combined with other diet and lifestyle factors, it appears that approximately 70% of colon cancers can be potentially avoided. Replacing red meat with a combination of fish, nuts, poultry and legumes will also reduce risk of coronary heart disease. Thus keeping red meat consumption low is best viewed as part of an overall dietary and lifestyle strategy to optimise health and well-being (Willett, 2005). Armstrong D, Doll R. Environmental factors and cancer incidence and mortality in different countries, with special reference to dietary practices. Int J Cancer 1975;15:617-631. Willett W. Diet and Cancer: an evolving picture. JAMA 2005;293:233-234. An Auckland GP was concerned about high rates of methadone and diazepam use we attributed to him in his recent annual report and asked us to check it. He has not prescribed methadone for several years and rarely prescribes diazepam. Our check showed the bulk of claims for these items had come from two pharmacies and nearly all the scripts were linked to just two NHIs. The NHIs we access are encrypted; this allows us to attribute dispensings to individuals but we do not know who the individuals are. The GP was able to sort the issue out with the pharmacies concerned. Both patients were on daily dispensings and each dispensing is put through as a separate claim. The patient on daily methadone and diazepam had obtained a script from the GP in the past and the GP’s NZMC number was still being used although the drugs were being prescribed by Auckland Regional Methadone Service. Frequent dispensings also caused problems for another GP who could not understand the high rates of atorvastatin use we attributed to her. This also turned out to be a frequent dispensing issue. Some of her patients were on weekly or monthly dispensing in an attempt to improve adherence and sort out medicine mix-ups. This GP asked if there was a better way to present prescribing data than number of dispensings. We have worked on this, and in this issue of ‘best practice’ we have presented the data in your report based on the number of individuals on particular antidepressants rather than the number of dispensings.